Researchers have developed a high-speed camera that can capture video a thousand times faster than traditional high-speed cameras. It's called Sequentially Timed All-optical Mapping Photography, or STAMP for short, and records at one trillion frames per second. That's just fast enough to capture waves of atoms passing through crystal structures, which move at about a sixth of the speed of light. 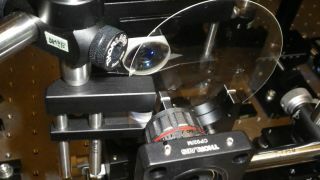 The device was created by Keiichi Nakagawa from the University of Tokyo. He saw that the speed of conventional high-speed cameras are limited by their mechanical and electrical components - so used just fast, optical components instead. It works by splitting ultra-short flashes of light into different colours like a rainbow. These hit the imaged object in quick succession, and can then be analysed to see how the object looked over the duration of the flash. The first version could only take six frames, but that has since been expanded to 25. Nakagawa believes it could be improved to 100 with current technology. He adds that he thinks the camera "holds great promise for studying a diverse range of previously unexplored complex ultrafast phenomena".